* short circuits or open circuits in the primary winding of the distribution transformer. * short-circuits in the secondary winding. The ADOC-3 works without disconnecting the secondary windings of the transformer from its loads. 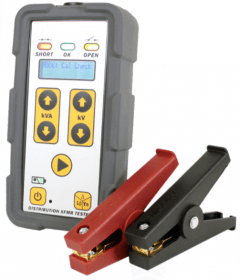 The instrument requires an electrical connection to the primary bushings and thus shows the diagnostic readings with a visual and audible signal. The ADOC-3 allows to analyze if it is safe to re-energize the transformer after an interruption such as line failure or storm (the transformers must be recharged regularly and if they are connected to a faulty circuit they run the risk of breaking when energized again with a lot of energy). For de-energized transformers from 5kVA to 3MVA. Detects the primary short circuit of the transformer, open circuit and secondary short circuits. Contact measurement in the primary bushing of the transformer, without the need to remove the secondary cables. Automatic self-test and automatic shutdown.